You probably love cuddling with your SO, but maybe sometimes you just wanna cuddle cute, baby animals too! Come hang out and celebrate goats at this awesome 2nd annual free event, complete with a wine bar, pop-up art gallery, surprise musical guests, and more! If you want the VIG (Very Important Goat) experience in a cool photo booth, it costs $50 and is so worth it. Make all your friends jealous on Instagram! Details here. The California Academy of Sciences transforms into an exciting place for adults of all ages to come explore every Thursday night. The aquarium, rainforest, planetarium and more are open to check out without children around, which, let’s be honest, you’ll probably run around like a kid yourself at this event. This Thursday, the museum is pairing with Noise Pop for an official pre-party like no other! There will be art, dancing, silent discos, yummy chocolates and alcohol; perfect ingredients for a fantastic Valentine’s Day. Plus, special musical guests throughout the night! Tickets and info here. If you and your partner are big gamers, this is the event for you! With food, drinks and a bunch of video games to play, you’ll be entertained all evening! According to their site, “Games available range from classic to new releases on both console and PC. Games and controllers are provided so all you need to do is bring some friends!” Awesome! There are a couple different ticket options, which you can find here. Can’t wait until Halloween to go through a haunted house? You’re in luck! If you’re a couple that LOVES getting scared, you can’t miss this event! From Fear Overload Scream Park comes a scary alternative to a sweet date. This haunted house is massive, and you only get one dim flashlight to navigate your way through it. You can, however, purchase flickering candles, glow sticks, and vampire repellant… if you think you need it. Mwahaha! Tickets go fast for this, so get yours soon! Horrifying details and more here. For the treat-lover in your life, and let’s be real, ice cream is the BEST dessert, check out this super sweet ice cream tour! 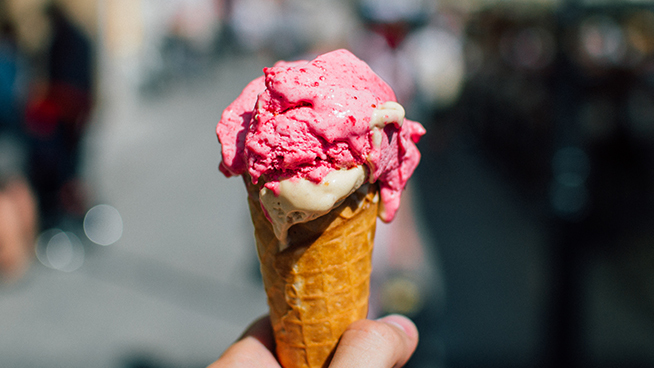 Over the course of an hour, explore a variety of ice creams and history of ice cream. If you’re planning on a low-key evening, like ordering pizza in and watching a movie on the couch, this could be a fun way to get out for a bit! Whether you’re a mint chip, rocky road, cookie dough, or french vanilla fan, this is a great way to share your love of ice cream with your favorite person. Info here! Still looking for gift ideas? We got you! Check out these ideas and have an awesome Valentine’s Day!